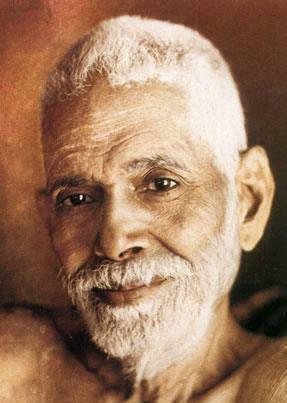 In Sri Ramana's teachings there is a clear water divide between the absolute Self and the mind. All mental forces are like a house of cards that support each other forming a kind of mental balance. In the center of the mind there is that which is called ego, a supposed entity like a prison guard checking all prisoners, the thoughts. The ego is formed during our whole life and acts or rather re-acts from memory coming from pleasant or unpleasant occurrences.When the manipulating and controlling power of the ego does not hold, the so-called 'balance' of the person is believed to be in danger. Here the practical aspects of Bhagavan's teachings have their starting point. If this center starts to observe instead of to manipulate, if we are aware of all objects including foremost all mental objects, the mind settles down. Mostly it will be a pleasant relaxing experience - as long as the ego doesn't feel threatened regarding its imagined independency and dominance. If memories or emotions rise that are painful or cause fear, anger, dullness or similar emotions, the ego-mind, the will-power, will start to react as it always does. It will try to evade, or overcome or fight them. The meditator will want to get up and do something else to not feel them. Or he or she will project these emotions on someone or something outside and try to fight them in that relationship. This is the start of the 'second class' in spiritual training. All those that merely want to enjoy some relaxation will break off, while those that have a genuine yearning for Truth will develop strength and persistence. Also those that are still stuck in the first class and merely want to enjoy some devotional feelings will be left behind at this point. They may not be clear that all devotional feelings are as fleeting as all else. In that case the mind has won and kept its ego-'balance', shielding the awareness from unpleasant feelings. If there is greater intuition of the preciousness of true silence and its peace, perhaps after many break-ups like described before, the courage to stay on will grow. Because true silence is not afraid, it even grows when challenged like that. In as much it is aware of its spaciousness it has also room for all kinds of mental activities and finds more and more freedom in this true equanimity. This makes it clear immediately that we are only looking at something, the awareness itself can never be an object of perception, whatever it may be, a physical tension, an emotion, a memory etc. In the story of Buddha's enlightenment the devil, Mara, always the essence of ego, of duality - in the Christian Symbolism therefore with two horns - tempts this power of equanimity through sending his beautiful daughters. The Buddha to be tapped the earth as a sign of his solidity and could not be moved. After this the final enlightenment experience opened up. In the famous death experience of Sri Ramana the fear of death stood out prominently, but the power of his insight and the surrender to the Self was much too strong and so he went beyond the realm of death once for all. Concluding we can summarize that all emotions are testing our maturity. As long as we re-act we are caught in the old and learned patterns. In as much as we can remain as awareness by all means, the power of the emotional mind gives way for the Self. Other thoughts arise more forcibly when you attempt meditation. There was immediately a chorus of questions by a few others. Sri Maharshi continued: Yes, all kinds of thoughts arise in meditation. It is but right. What lies hidden in you is brought out. Unless they rise up how can they be destroyed? They therefore rise up spontaneously in order to be extinguished in due course, thus to strengthen the mind. Thank you for this very relevant post. Reminded of David Frawley in his book "I came to the Ramanashram to contact Ramana and his path of Self-inquiry, which is a method to experience the non-dual state of pure awareness. the child of fire, who demanded purification, death and spiritual rebirth. I encountered one of the Gods, not as a devotional or cultural image but as a primordial and awesome power. Ramana came to me through Lord Skanda, the son of Shiva, with whom Ganapati Muni identified him. I came to understand Ramana as Lord Skanda, the embodiment of the flame of knowledge. Coming into Tiruvannamalai I felt the presence of a tremendous spiritual fire, which also had, in its more benefic moments, the face of a young boy. out of a fire, kept arising in my mind. This brought about an intense practice of Self-inquiry that was literally like death, though it was the ego’s death,not that of the body. intense spiritual experience of my life, to the point that I had at time to pray that it would not become too strong! Yet afterwards I felt refreshed and cleansed, with a purity of perception that was extraordinary." Self-enquiry when practised thoroughly is an intensive purification process, and one often goes through trials of fear and emotional upheavals as an outcome of sadhana. David Frawley has a certain way of experiencing and coloring these in certain patterns of feelings and concepts. The actual inner process may take very different forms of experiences with different people. It could be also very simple, just surrendering all mental perceptions and remain more and more as pure awareness which is peace, the Self. Yes that's true. It takes different forms of experiences with different people and could be very simple as well.